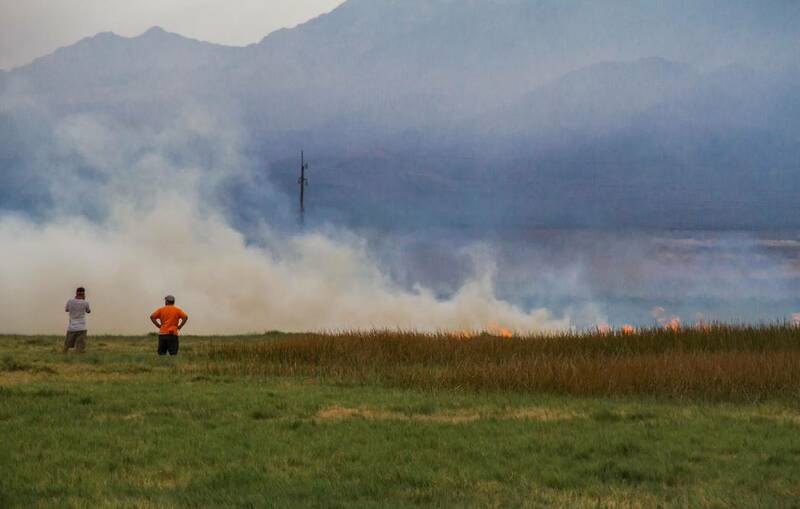 Lightning ignited a brush fire on public lands in Tecopa on Monday afternoon, burning 27 acres and traveling up to the very edge of the residential hot springs community. Nancy Good Special to the Pahrump Valley Times Pahrump Valley Fire-Rescue respond to a brush fire on public lands in Tecopa on Sept. 11, 2017. The cause of the fire was considered to be lightning, which struck just after 3:30 p.m. The fire was considered contained by 9 p.m.
Nancy Good Special to the Pahrump Valley Times A brush fire in Tecopa was responded to by Pahrump Valley Fire-Rescue on Sept. 11, 2017. Fire crews brought a tender and brush engine to the scene of the blaze that lasted more than five hours. Nancy Good Special to the Pahrump Valley Times Pahrump Valley Fire-Rescue fought a brush fire in Tecopa on Sept. 11, 2017 that lasted more than five hours. The blaze was thought to have been started by lightning. 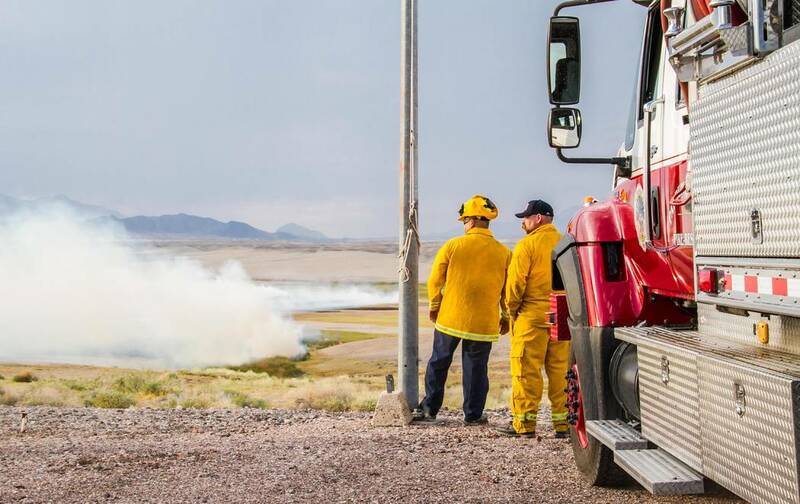 Nancy Good Special to the Pahrump Valley Times Fire crews from Pahrump Valley Fire-Rescue fought a brush fire that spread across 27 acres in Tecopa on Sept. 11, 2017, which was thought to be caused by lightning. The blaze that started in the afternoon, just after 3:30 p.m., was fully contained later that night around 9 p.m.
Pahrump Valley Fire and Rescue responded to the scene with a tender and brush engine, said Inyo County Sheriff Bill Lutz, followed shortly by U.S. Bureau of Land Management firefighting crews. The blaze was considered contained with no structural damage by about 9 p.m. The strike occurred at 3:35 p.m., according to Tecopa resident Ila Ross, who saw it happen. 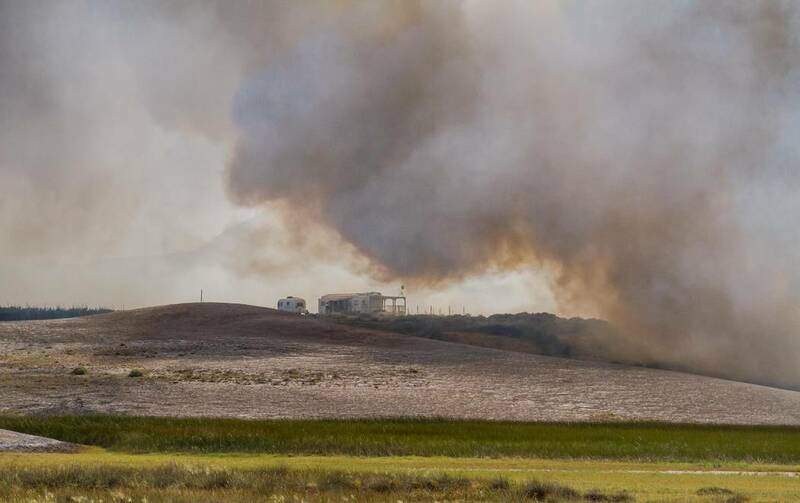 It hit the marshlands at the back of the Grimshaw Lake Natural Area just outside the neighborhood of Tecopa Hot Springs and the fire spread rapidly uphill toward an isolated residence. Pahrump Valley firefighters were able to defend the residence, and another some distance away, and knock the fire back, said Sheriff Lutz. A BLM crew was dropped on the scene by helicopter and Superintendent Dean Hall of the BLM assumed incident command. Two BLM fixed-wing aircraft also responded along with an engine from the U.S. Forest Service. Southern Inyo Fire Protection District stood by with water tankers. The ground cover was mostly marsh grass, said Sheriff Lutz, and rainfall and humidity helped to hold back the spread of the fire. But when the flames hit the sagebrush nearer to the residence “they just blew up,“ Lutz said, making it harder to get the blaze under control. The BLM declared the fire contained and released the mutual aid resources about 9 p.m., said Capt. Richard Wiegand, National Park Service firefighter deployed out of Joshua Tree, on Tuesday morning. Weigand said the BLM had been monitoring the area overnight without incident. They expected to maintain resources on the ground for the rest of the day, Wiegand said, and would be patrolling the area for some time. At the height of deployment, Wiegand estimated that about 40 to 50 firefighters were on the scene of the Tecopa fire from Las Vegas, Joshua Tree, Apple Valley, San Bernardino and other locations. Wiegand stated that the residences at the edge of the fire were successfully protected by Pahrump Valley Fire and Rescue before BLM crews arrived. “They did a great job,” Wiegand said. Local firefighting agency Southern Inyo Fire Protection District depends upon mutual aid from Pahrump Valley firefighters in any large-scale firefighting situation, said Battalion Chief Larry Levy of the Southern Inyo Fire Protection District and that district is grateful for their quick and unfailing assistance. Federal crews usually respond to the area from Apple Valley, California, 150 miles away, and work in conjunction with local agencies who may be able to get there faster. Much of the land surrounding the towns of Tecopa, Shoshone, Death Valley Junction and Charleston View are federal lands, some of them under special environmental protection. Any wildland fires on public lands are under the jurisdiction of the BLM. Crews are usually accompanied by a resource specialist, said Wiegand, who provides guidance on deployment in environmentally protected areas such as the Grimshaw Lake Natural Area, known for its marsh and wet pools as a bird habitat. 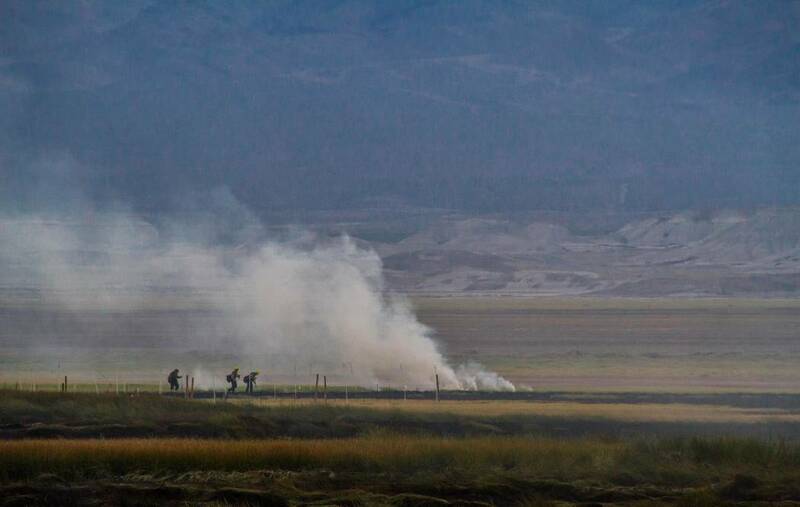 Inyo County Sheriff Bill Lutz encouraged local residents to be vigilant about clearing sagebrush from their property and maintaining at least 30 to 60 feet of defensible space around their homes. Robin Flinchum is a freelance writer and editor living in Tecopa, California. Her book, “Red Light Women of Death Valley,” was published last year.